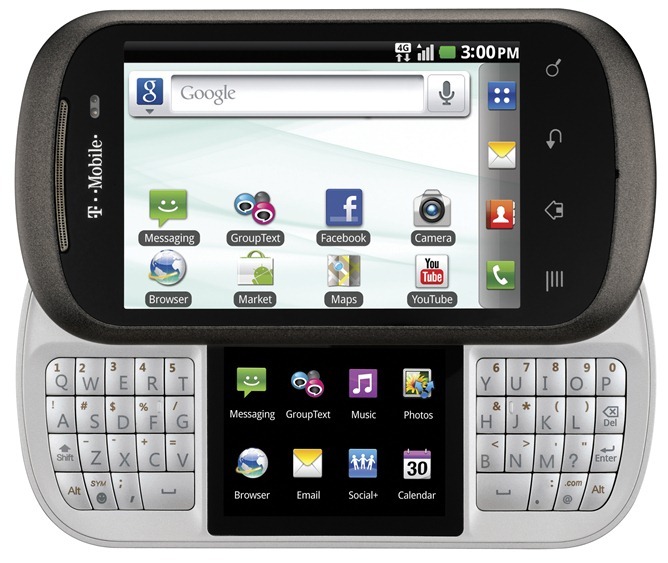 Confirming the leak from last week, LG and T-Mobile USA have announced the whacky LG DoublePlay Android 2.3 smartphone. In portrait mode the phone is a fairly standard, albeit smallish, Android device, but slide it open and suddenly you have an extra screen in between a full QWERTY keyboard. The press release boasts a lot about the DoublePlay's dual capacitive touch screens, which supposedly makes the device the "ultimate multitasking handset". There are few specifics on exactly how the two screens will work, but they can apparently "operate independently or in tandem", allowing users to perform multiple tasks at once "such as updating their Facebook pages while simultaneously surfing the Web, texting or checking email". Even if the phone could seamlessly support the operation of two completely different tasks, I am unsure how useful a 2-inch screen is when I want to compose an email. The DoublePlay is expected to be available exclusively from T-Mobile "in time for the holiday season". SAN DIEGO and BELLEVUE, Wash. ¾ October 17, 2011 ¾ LG Mobile is once again challenging the fastest thumbs in the nation to the ultimate text messaging challenge ¾ the fifth annual LGU.S. National Texting Championship, featuring the new LG DoublePlayTM. Announced today, the LG DoublePlay is the ultimate multitasking handset, featuring a split QWERTY keyboard and dual capacitive touch screens, making simultaneous mobile activities easier than ever. During this year’s competition, 13 contestants will use the LG DoublePlay, which is powered by a 1GHz Qualcomm Snapdragon® processor, to compete in the ultimate texting showdown for the chance to win a $50,000 cash prize and a once-in-a-lifetime spot in texting history. Equipped with dual customizable touch screens ¾ a 3.5-inch main display and 2.0-inch sub display ¾ that operate independently or in tandem, as well as a full slide-out QWERTY keyboard and Swype® for easy text input, the LG DoublePlay allows users to perform multiple tasks at once such as updating their Facebook pages while simultaneously surfing the Web, texting or checking email. LG first set out to crown the fastest thumbs in America in 2007 when more than 500 contestants battled it out for the U.S. texting title. Now a national phenomenon, last year’s Championship featured a record 500,000 competition entries and became the subject of a MTV documentary called “Thumbs” by Academy Award-winning filmmaker Bill Couturié. Providing an exclusive look at the growing phenomenon of texting among today’s youth, the film provided a first-hand look at player preparationsduring the marathon race to the 2010 LG National Texting Championship. Moreover, “Thumbs” underscored the increasing importance of texting as one of today’s preferred methods of mainstream communication. For more information on the LG U.S. National Texting Championship, please visitwww.facebook.com/lgtexterus.